Are you back in the office today fighting to get past the holiday vacation fog and generate content ideas for 2018? Join the club! A busy upcoming 2018 schedule, combined with writer’s block and peppered with a little bit of procrastination, can sap your energy and drag down the quality and quantity of your content creation. If you’ve been working on developing your inbound marketing content for a while, you may even find yourself running into a wall when it comes to new ideas. A brainstorming session with a team of great thinkers might do you some good. But maybe that’s not an option as you find yourself sitting alone at your desk with a looming deadline. So where can you find new ideas? This is one of the simplest ways to create blog posts. Think about the pain points of your potential customers and then come up with solutions by offering your own expertise. Come up with topic ideas like, “5 Ways to Increase Your ______” or “6 Reasons You Should Stop ______." Fill in the blanks to draw in readers by addressing their needs while moving them down the sales funnel. Industry news is a great way to keep your readers apprised of current events in your world. But if nothing is happening, then go ahead and grab ideas from other news sources. For instance, the recent solar eclipse was a hot topic that many companies used to draw attention to their products—even products that had seemingly nothing to do with the sun and the moon. See what connections you can between your business and the current news to keep things fresh. You can easily connect the beginning of 2018 to starting good new habits in your business. If you have staff members who have never been “introduced” on your blog, consider featuring some of them in series of posts. Give a rundown of what they do, why they do it, and what makes them an expert as part of your team. Avoid making this read like a bio or resume, but make it more like a friendly interview. This allows readers to get to know your team better, building a sense of relationship, trust, and connection. Busting myths is a fun way to educate your readers and teach them that what they’ve heard through urban legends or wives tales isn’t always true. Identify top misconceptions in your industry and then seek to debunk them through research, facts, and experience. This should aim to lower walls and minimize objections that might keep leads from becoming customers. As an authority on your industry, keeping your readers apprised of upcoming trends makes you a valuable resource. Consider how new technology or social trends might impact your industry and take some time to update your readers on your future predictions for the upcoming season or year. A rundown of “how far we’ve come” can sometimes act as a prod for people who are stuck in the cycle of consideration. Depending on your business, reminding people of the “good old days” when they took a risk by purchasing an Atari game console or a microwave may remind them that risks do pay off. After glancing back, consider also taking a peek forward to lead readers gently in the direction of their needs for your product. Sometimes your readers may just need a good chuckle. Try offering them a bit of insight into the amusing things about your world, such as funny requests from clients or silly stories about your product. Depending on what is appropriate for your industry, a bit of lighthearted fun often has the ability to give your reader insight into your personality while building trust and affection. If your company is involved in social causes, then share that information with readers as a “feel good” opportunity. Whether you’ve got a team running in a marathon for charity, or you’ve recently gotten involved with a local non-profit, make it known. This reveals the human side of your business and creates a desire for your readers to be part of the story. Don’t forget the reason that you’re here—to bring your potential customers along with you on the journey toward conversion. 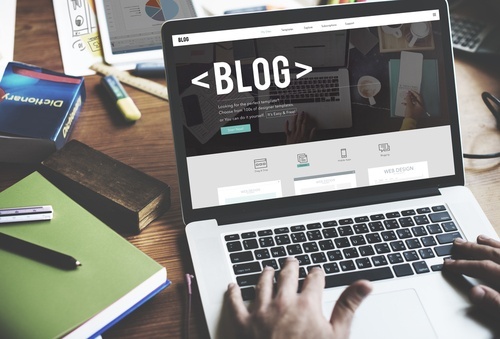 The three steps of the Buyer’s Journey include Awareness, Consideration, and Decision, and every one of your blog posts should be targeted to carry your readers through this funnel. This might be making readers aware of information, building trust, educating, inspiring, and gently nudging them toward becoming qualified leads.